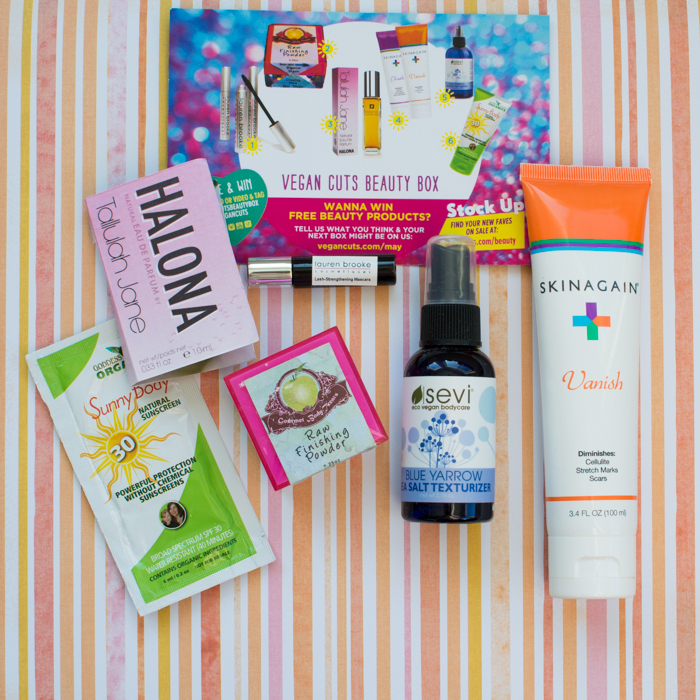 Home » Vegan Cuts May 2014 Beauty Box Review! 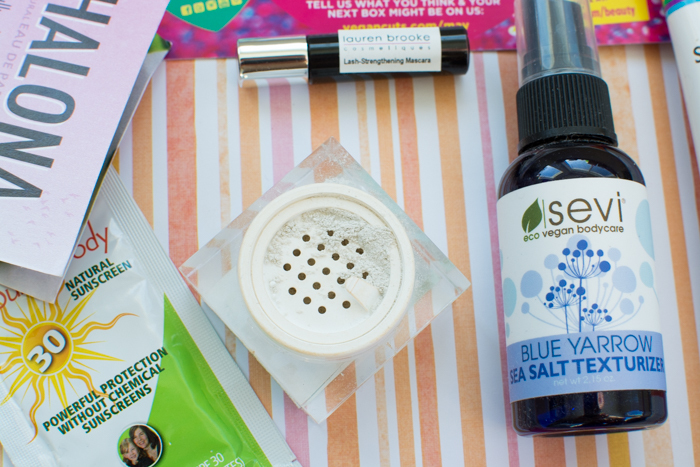 Let’s take a peek inside May’s beauty box from Vegan Cuts! Description: Vitamin-rich mascara made with herbs and extracts to help strengthen, lengthen, and protect your lashes. Ingredients: Certified Organic Aloe Barbadensis (Aloe), Sorbitol, Certified Organic Ricinus Communis (Castor) Wax, Certified Organic Equisetum arvense (Horsetail), Certified Organic Arctium Lappa (Burdock), Certified Organic Herbal Extract Blend, Non-GMO Radish Root Ferment Filtrate, Cetearyl Alcohol, Certified Organic Lecithin, Glyceryl Stearate, Citrus Aurantium Amara (Orange Peel) Wax, Ecocert Helianthus Annuus (Sunflower) Wax, Vitamin B Complex, Iron Oxide. It’s so cool that we can get a little sample size of mascara and even a full-size in some cases. I don’t know how many mascaras I’ve bought and hated, but there’s not much you can do unless the store has a very generous return policy. Lauren Brooke’s lash strengthening mascara is made from natural ingredients and delivers a natural look. It’s buildable to an extent. I did find with any kind of activity like walking it bled a little. I shouldn’t forget that it helps grow healthier lashes too. Description: Oil-absorbing, line-minimizing natural finishing powder that’s sheer and ideal for all skin tones. Ingredients: Organic Arrowroot Powder, Bamboo Extract, Olive Leaf Extract, Pink Clay, Chamomile Extract, Green Tea Extract, Kaolin Clay, Plantain Extract, Sugar Beets, Hibiscus Extract, Coconut Extract. A finishing powder is usually a translucent powder though it can be tinted that you apply after your foundation. It helps blur fine lines and minimize pores. Well okay! I tried this out on some warmer days and I definitely noticed I wasn’t as dewy in my t-zone. I would like to try out some basic cornstarch or tapioca starch and see if I get the same result. Description: Eau de Parfum bursting with the aroma of fresh limes, ginger, and warming eastern spices. It sounds like it should smell like food and while it does smell delicious it’s more perfum-y than tasty. I smell lime first, but it’s softened by some other herbal scents. Love it! Description: Vanish cream that helps reduce the appearance of stretch marks, cellulite, and scars. Disclaimer. I generally have a poor attitude towards products like this. I feel like they’re gimmicky and preying on women who feel poorly about themselves. So I don’t know how fair I can be. Here are my pros/cons. Pros: All of their products are vegan and cruelty-free. I feel good perusing their website. They offer an array of other products too that are inherently appealing. Cons: for optimal results apply 2-3 times a day. Dudes I’m sorry, but this is like a catch22, if I don’t think a product can work, I won’t try to use it, and it definitely won’t work. 2-3 times a day! I don’t have time for that. I would rather do squats and eat clean—I know that gets rid of cellulite. Reduce scars? Can it do better than coconut oil? Okay I’m sorry. I’m done. How do you feel about products like this? Have you had a good experience with Skinagain?? I haven’t had a bad one, I’m just super cynical. Description: Texturizer spray for hair that gives light body and defined curls without stiffness and residue. I liked this so much I ordered their hair lotion. I have curly-wavy naturally frizzy hair and this helped defined the waves and reduce much of the frizz. It wasn’t stiff or drying and the smell is great too! I thought I smelled like sea buckthorn, but maybe it’s the blue yarrow? Either way very refreshing! Description: 100% biodegradable and water-resistant sunscreen containing nourishing aloe vera and sunflower oil. I avoid sunscreen in most scenarios unless I’m hiking/biking in direct sun for hours or at high altitude. I feel more weird about the chemicals in sunscreen than I do the sun itself and vitamin D is good for you. Natural sunscreens are another game though and if I could find one that doesn’t leave the white zinc mask I would love it! Any recommends?